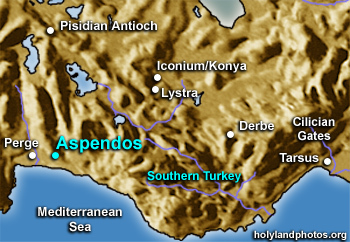 Aspendos is an impressive Roman site famous for is very well preserved theater. It is situated 28 mi. [45 km.] east of Antalya, 19 mi. [30 km.] east of Perge, and 9 mi. [14.5 km.] inland (north) of the Mediterranean Sea coast. After passing into and out of Greek and Persian hands, it submitted to Alexander the Great ca. 333 B.C., but had to pay annual tribute of 5,732 lb. [2,600 kg.] of gold to him! Subsequently it was variously controlled by the Seleucids (Syria) and the Ptolemies (Egypt). During the first and second centuries A.D. significant building activities took place. At the site the theater, aqueduct, and stadium are quite well–preserved.